Warhammer: Vermintide 2 (game, 2018). A first-person action video game by Fatshark AB. Developed by Warhammer, Fatshark AB, Fatshark. Official Trailer. Warhammer: Vermintide 2 is a first-person action video game by Fatshark AB, developed by Fatshark AB, Fatshark and Warhammer. 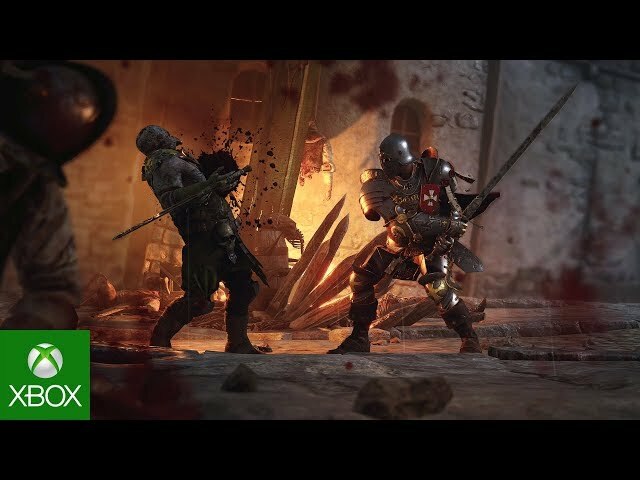 Warhammer: Vermintide 2 | Xbox One Release Trailer. The game is set in the Warhammer Fantasy universe during the early days of the End Times, an apocalyptic event that eventually ended in the destruction of the Warhammer World. The game follows the Heroes of Ubersreik from the first game against the skaven hordes of Clan Fester and their new allies, the Rotbloods (a chaos warband dedicated to Nurgle, the Chaos God of Disease and Decay). Following the events of the first game, Grey Seer Rasknitt (antagonist of the first game who was presumed dead and leader of Clan Fester) has successfully captured the five Heroes of Ubersreik. Without the interference of the heroes, the city of Ubersreik fell to the forces of Clan Fester. Rasknitt has since ordered the construction of a massive portal known as the Skittergate, which will allow the Chaos Champion Bödvarr Ribspreader and his Rotblood army easy access to the border-city of Helmgart. However, the Skittergate intermittently fails, preventing Bödvarr from summoning his entire army. When the Skittergate disastrously fails to activate again, the resulting destruction frees one of the heroes, Markus Kruber, from captivity. 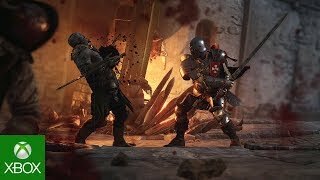 He fights his way through the skaven lair and reunites with the rest of the heroes: Victor Saltzpyre, Bardin Goreksson, Sienna Fuegonasus and Kerillian. They escape the lair and are transported to a ruined keep where they meet up with the rest of their allies: Franz Lohner (a former innkeeper who directs the heroes' missions) and Olesya Pimenova (a witch who creates the bridge of shadows, the heroes' main method of transportation). Reunited, the heroes and their allies work together to stop the combined forces of Skaven and Chaos. They first slay the sorcerer lord Burblespue Halescourge, who attempted to enact a ritual to unleash a massive plague upon Helmgart. Next, they defeat skaven warlord Skarrik Spinemanglr, who had set up a base in a fallen dwarfen hold. Enraged by the heroes' continuous interference, Bödvarr sends the majority of his forces to discover the heroes' keep and eliminate them. However, this leaves his war camp lightly defended. The heroes attack Bödvarr's war camp and slay him in an arena. Warhammer: Vermintide 2 was scheduled to be released by Fatshark AB on March 8, 2018, on July 11, 2018 and on December 18, 2018. It is a multiplayer and cooperative gameplay video game. The game is made with Autodesk Stingray engine.